For centuries, skilled foresters have nurtured and trained Leather Vines–a small animated shrub found in dense Darkwood Forests. With a great deal of patience and a high tolerance for being whipped and strangled, the vine sprouts can be coaxed into performing amazing feats. Leather Vine Bracers can be in one of three different growth stages. Use the mechanics and rarity below that correspond with the appropriate stage. As an action, you can target an object within 15 feet and cause vines to latch onto it. You can use a bonus action to draw the object to you or pull yourself to the object if it weighs more than you. As an action, you can target either a creature or an object within 15 feet and cause vines to latch onto it. If you target an object, you can use a bonus action to draw the object to you or pull yourself to the object if it weighs more than you. If you target a creature Large or smaller, it must make a Strength check DC 13. On a failed save, it becomes grappled (escape DC 13). Until this grapple ends, the target is restrained, and you can’t attempt to grapple another target. 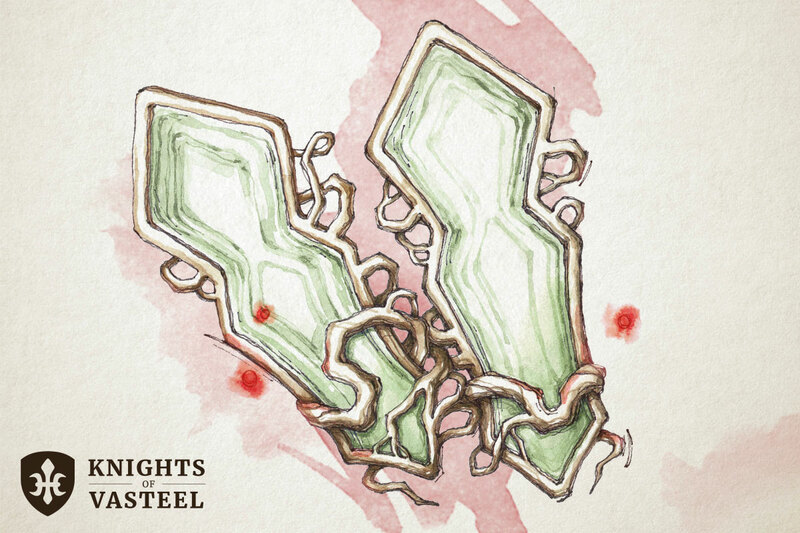 As an action, you can target either a creature or an object within 30 feet and cause vines to latch onto it. If you target a creature Large or smaller, it must make a Strength check DC 15. On a failed save, it becomes grappled (escape DC 15). Until this grapple ends, the target is restrained, and you can’t attempt to grapple another target. Additionally, the vines constrict on the grappled creature taking 2d6 Force damage at the start of each of its turns.